So I've heard so much about this non-halal restaurant serving really good burgers, The Hungry Hog was one of my want-to-go eatery. Well, a couple of weeks back, I had the chance to dine there when a few of us decided to crash there for dinner. Located in SS15 Subang Jaya, it was by no means near to my house, but i did not miss out the chance. Reaching the venue at around 8pm, I was surprised to see the place so packed with diners. Probably it's the weekends, or people just love the food here. I think it's the latter, as after the meal at The Hungry Hog, I was hungry no more. 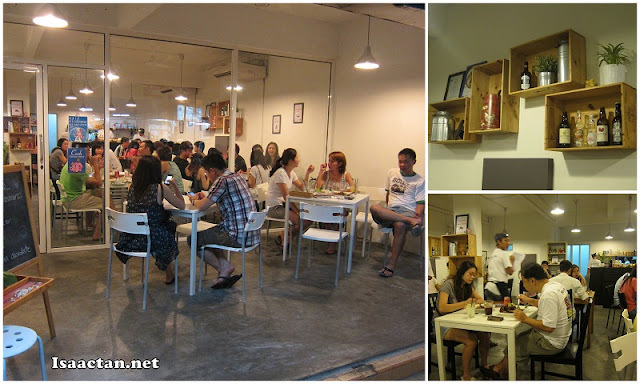 The restaurant decor was pretty simple, predominantly white in color. It was not long before the guys arrived, taking up four tables one shot. We did try to put the tables together, but I guess the huge crowd and space constraint did not allow that flexibility. Nevertheless, let the orders begin! 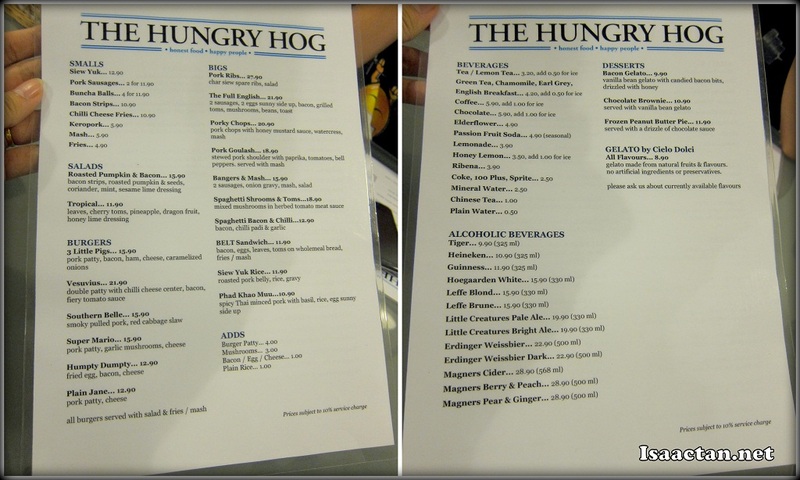 The Hungry Hog had these really simple two paged food menu, simple yet effective. Check out the below on what we had for dinner that wonderful evening. It was a sinfully calories laden meal, and for starters, we had these bacon laden fries. Topped with some mayonnaise, it was a really great start for more good things to come. I would have prefered if the fries were of the criss-cut type though. The Spaghetti Bacon & Chilli which was ordered did look really nice, with generous amounts of bacon bits. Consisting of bacon, chilli padi and garlic, I guess it caters for the spaghetti lovers. The subsequent two dishes that came was the Bacon Strips, which basically were these thin strips of fat laden bacon. Good for munching on though, but it'll spoil your dieting plans that's for sure. The Phad Khao Muu however was a variant of the usual western fare. Here we have spicy Thai minced pork with basil rice. The smell itself was really nice, and tasted good too, with the basil lending a lot of flavour to the dish. Coupled with a sunny side up egg, go for this dish if you like some rice in your meal. Specially designed for the pork ribs lover, you can never go wrong with Hungry Hog's Pork Ribs dish. It came in this huge platter, with mutiple delicious char siew spare ribs with salad. The serving was large enough for two actually, but if you love your spare ribs, then order one to be eaten all by your own! The crowd favourites, 3 Little Pigs Burger finally arrived, complete with pork patty, bacon, ham, cheese and caramelized onions. I personally ordered this burger for myself, and it was worth every cent. If you wish for a smaller variant, then go for the Super Mario burger, same pork patty, but without the extra bacon and ham. Yummy stuff I tell you. For the more adventurous diners, and those who can take really spicy stuff, then by all means go for the Vesuvius Burger. Benjamin ordered this, and by the end of the night, I noticed he was sweating. Vesuvius came in double patties, with chilli cheese center, bacon strips doused in fiery tomato sauce. I tried a bit, and I can tell you, it's definately not for the faint hearted. The spiciness level of this burger was off the charts, the more you bite into those yummy pork patties, the more your taste buds will scream for water. So have you tried the pork burgers at The Hungry Hog yet? If not, do drop by their restaurant over at SS15 should you get a chance. 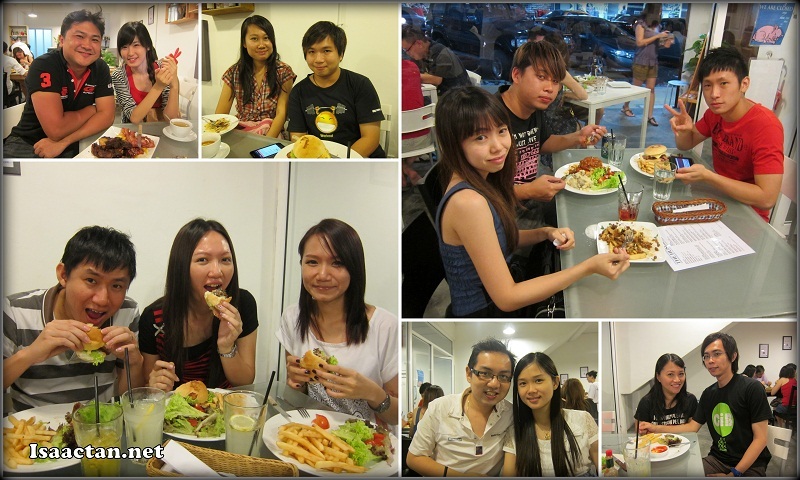 Good food, great company, happy times, here's looking forward to more nom-nom outings like these. Oh my God!!!! Bacon!!!! *goes weak in the knees* I want! I want!!!!! Oooooo....!!!!! wow must be very tasty that it is full house! Drooling at the bacon strips :OOOO Definitely trying it out soon, looks so yum! Pork dishes all the way...they seems to have varieties of food..not for diet people..
Everyone said it's nice there. Gotta go try for myself soon!